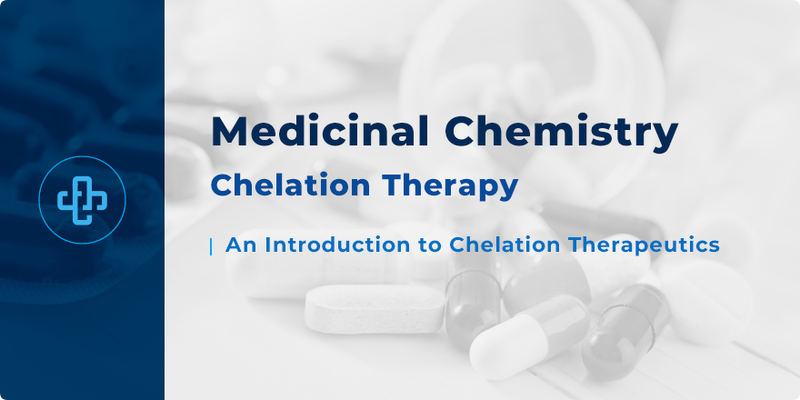 Chelation Therapy in Medicinal Chemistry | The Complete Guide! Metal poisoning is a serious medical problem. Affected persons may be exposed to heavy metals, for example, as a consequence of pollution or accidents. Here, we discuss the importance of chelation therapy; the medical means through which metal poisoning may be treated. Metal poisoning refers to the toxicity of certain forms of certain metals, usually heavy metals, to living organisms, at particular concentrations. Although the exact definition of the term ‘heavy metals’ is under debate, heavy metals are generally metals with relatively high densities, atomic weights, or atomic numbers. Examples of metals that are generally considered “heavy” include lead, mercury, cadmium and arsenic. Note that strictly speaking, arsenic is a metalloid, but some chemists refer to arsenic as a “heavy metal”. Metalloids are chemical elements which exhibit properties between that of metals and non-metals. Toxic effects observed are due to the metal accumulation in tissues and the interference of the metal with the functions of organ systems. Chelation therapy is the medical treatment of metal poisoning involving the administration of therapeutics known as chelating agents to remove the metal, at its now toxic level, from the patient. Chelating agents, which are used to treat heavy metal poisoning, are pharmacological agents with structural features that allow two or more sites (or donor groups) to bind to a metal and form a coordination complex. Since chelating agents are used to counteract poisoning, they are antidotes. A notable example of a chelating agent is ethylenediaminetetraacetic acid(EDTA). In chemistry, chelation refers to the formation of two or more coordinate bonds between the donor groups of a ligand and a metal. In medicinal inorganic chemistry and coordination chemistry, be aware that the term ligand also refers to ions or moieties in a molecule that bind to a central metal atom to form a coordination complex. Note: Can you also define the term ligand in pharmacology and biochemistry? Denticity refers to the number of donor groups found in a single ligand that binds to a metal atom in a coordination complex. 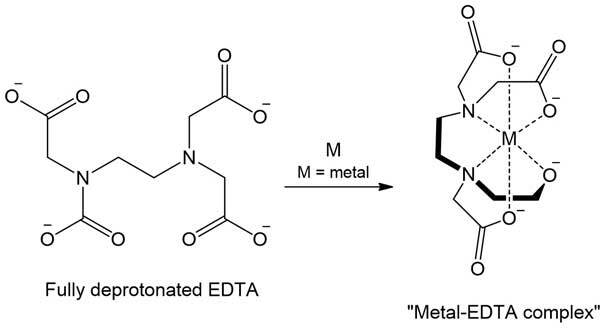 As shown in the image, the chelating agent EDTA binds to a central metal atom through six donor groups. Ligands which can form coordination bonds with more than one group are termed polydentate (or multidentate). EDTA is a hexadentate ligand (hexa- referring to six). Chelating agents, which are polydentate ligands, are capable of binding tightly to metals due to a phenomenon known as the chelate effect. The chelate effect increases the higher the denticity of the ligand. 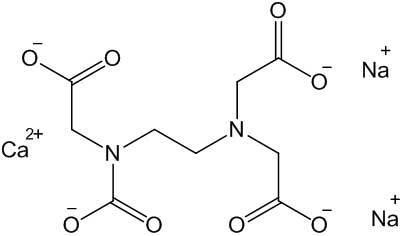 A calcium disodium salt of EDTA, Calcium Disodium Ethylenediaminetetraacetic acid (CaNa2EDTA) is a widely used chelating agent in chelation therapy, usually for the treatment of lead poisoning, and often used in conjunction with dimercaprol. 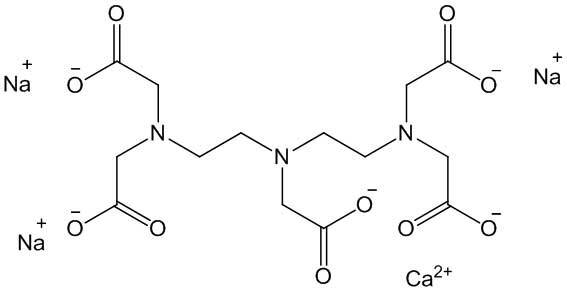 Another name for CaNa2EDTA is calcium disodium edetate. As previously outlined, this ligand is able to bind to metals as a hexadentate ligand, via the two amine groups and the four carboxylate groups. Dimercaprol (BAL) bears to thiol groups and an alcohol. BAL is used for the treatment of gold, arsenic, bismuth, antimony and mercury poisoning. Drawbacks of BAL include its narrow therapeutic range and the risk of serious side effects such as nephrotoxicity. Dimercaptosuccinic acid (DMSA) bears two thiol groups and two carboxylic acid groups. DMSA is used for the treatment of arsenic, lead and mercury poisoning. DMSA that has been radiolabelled with technetium-99m (99mTc) is also used for diagnosis. CaNa3DTPA is generally used in chelation therapy to treat cadmium and beryllium poisoning. In addition to these, CaNa3DTPA has also been used to treat poisoning involving transuranic elements, which are chemical elements with atomic numbers greater than 92 (uranium’s atomic number is 92), such as plutonium and americium. All transuranic elements are unstable and radioactive, decaying into other elements. (1) Flora, S. J. S.; Pachauri, V. Chelation in Metal Intoxication. Int. J. Environ. Res. Public Health2010, 7 (7), 2745–2788 DOI: 10.3390/ijerph7072745.